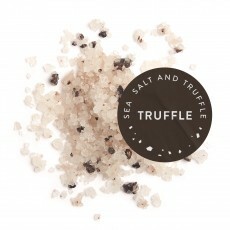 We infused our 100% Pure Amagansett Sea Salt with imported black winter truffles. This blend is speckled with bits of black truffles and has a pleasant, not-too-strong aroma and a wonderful truffle flavor. We use real black Périgord truffles (Tuber Melanosporum) imported from France - the brininess of the ocean and the earthiness of the soil mixed in one! This is not the so-called "truffle salts" that are all too common and deliver an artificial aroma from laboratory-fabricated "natural truffle flavor." If that is what you are looking for, please do not select this salt blend. This salt blend is for you if you instead want to naturally amplify, enhance and intensify the earthy flavor in your food. By starting with whole truffles and not truffle oil or truffle essence, our real truffle salt gently pushes underlying flavors forward without taking center stage. This is how we like it, and we think you will enjoy it as well. Use this finishing salt blend on steak, vegetables, potatoes, mushrooms, risotto - you name it. In our kitchen, this truffle salt is a must-have on eggs (baked, scrambled, omelets) and corn on the cob. Our kids use it all the time on popcorn.